In particular for foreigners (EU and non-EU immigrants), this alignment implies the radicalisation of an explicit agenda of reduction and re-evaluation of rights that leaves us without any significant representation in the British side of the negotiations. If the June election represents a new political opportunity, then the challenge is to organise our communities. In this article I would like to suggest some ways a social movement of foreigners might be able to defend the civil rights of immigrants and counterbalance the conservative turn during the Brexit negotiations. Rather than just a geopolitical decision, Brexit has assumed the character of a social shock, producing a general sense of confusion and paralysation of vast sectors of society. Silent but significant, the ‘Brexit effect’ has broken social institutions and suspended common spheres of interaction, transforming natural contexts of interaction into undefined territories. For nationals and foreigners, Brexit is affecting basic planning activities and the resolution of common practicalities. The Brexit effect is found in the silent fissures in everyday activity, suspending and paralysing the capacity to plan and take action in the social world. Activities such as working, studying, borrowing money, or renting a house have been placed in doubt. In the words of one foreigner, “without certainty about my future presence in the country, how can I plan my life and the life of my family? I have been living in the UK for more than 20 years, and I don’t know what exactly will happen.” The Brexit effect is found in the silent fissures in everyday activity, suspending and paralysing the capacity to plan and take action in the social world. Those fissures partially explain the successful advance of the conservative turn in the national agenda and, more relevant, the lack of political and social oppositions to counterbalance the authoritarian shape that Brexit is taking. This lack has many reasons, but one of them is surely the uncertainty produced by the Brexit effect. The uncertainty has promoted political fragmentation and social disconnection, making it difficult to create networks based on common ground and paralysing the political expression of immigrants. To make sense of Brexit is to place us in the political current context, and to recognise ourselves as an affected community that is being questioned and relativized. 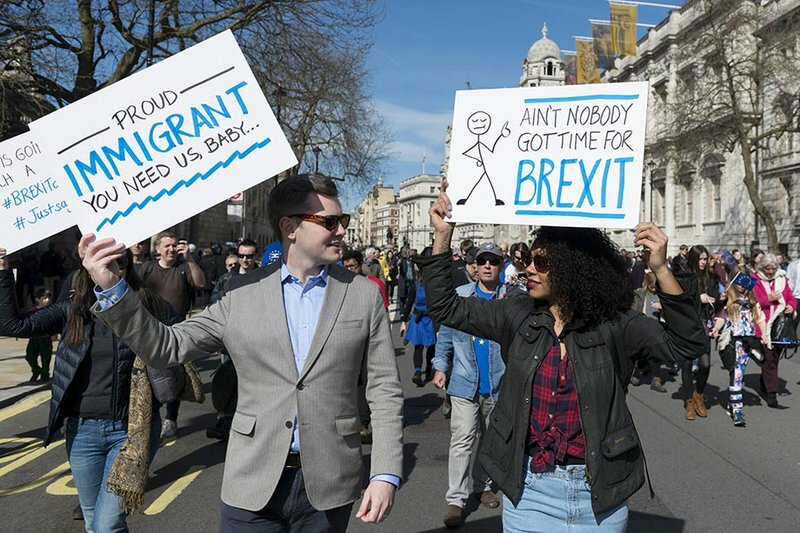 This community includes the large populations of immigrants in the UK, which, despite the distinction between EU and Non-EU-citizens, share the common condition of being foreigners in Britain. As foreigners we lack our own representation, and as such it is difficult for us to find a proper voice in the national debate. We urgently need to build a collective and democratic representation of our community, which can promote our rights and status as foreigner citizens. This representation would likely be most effective if it took the form of a multitude of collectives, as decentralised and distributed collaboration between equals is the most efficient mechanism to propagate information and concerns. Our representation should also be democratic, recognising the diversity of our beginnings and expressing the different ways in which our lives will be affected by Brexit. As foreigners we lack our own representation, and as such it is difficult for us to find a proper voice in the national debate. Such an effort would require overcoming the current distinctions of our community and placing the representation of the general interest over the defence of particular civil privileges. If equality under the law is guaranteed by the status of citizenship, our defence could begin there: with a citizen rights perspective that promotes equality between international and nationals. This requires eliminating any mention of a division between EU citizens and immigrants’ rights, broadening the points of convergence and widening our strategic field of operation. Most of our demands will relate to changes in UK immigration policy and its articulation with foreign and economic policy. A broadly articulated citizen rights perspective would help us here to avoid the reduction of our struggle to a list of specific, short-sighted demands. Furthermore, the implicit message of hard Brexit is not just the control of the number of people that can live in the UK, but also the control over who can be considered citizens, what kind of rights may be given and under which conditions. Hard Brexit suggests a segregated and discriminatory model of social incorporation that denies and relativizes foreigners’ rights as international citizens. This model is being enforced without the consensus of the majority of British society, but it is from this basis that we must plan our concrete points of intervention. First up is to define the minimum conditions that we require to live in peace and equality in the UK as international citizens. To do this we must take part in the public debate, contesting the monolithic vision of Brexit with a democratic and participative voice. And to do that we need mechanisms to coordinate and project the messages of local associations into the national debate. Yet, without first establishing common points and demands between all the UK’s diverse foreigners our efforts will be highly compromised. The next elections, as close as they are, are our principal opportunity to become a significant interest group in the Brexit debates. We must organise in a hurry, for if nobody in this country is defending our rights we must lead our own defence. We are here and we are not leaving! This article has been written by a participant in the #BristolBrexit - a city responds to Brexit initiative. The views expressed here are personal views and do not reflect the views of the University of Bristol or the funders of the organisers' research. #BristolBrexit - A City Responds to Brexit is a free public event at @Bristol on the 23rd of May from 10.00-13.00. The event, organised by the University of Bristol in collaboration with the University of the West of England and the University of Bath brings together stakeholders, practitioners, activists, educators, business people, city officials, religious leaders, and charity representatives to collectively and collaboratively address the challenges of uncertainty brought about by Brexit. The event will feature a series of interactive formats to bring representatives from across the city together to develop new and innovative strategies for taking Bristol into the future.